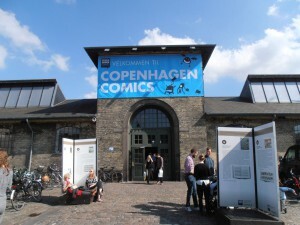 Continuing my tour of Nordic comic festivals, I took the train from Malmö, over the always impressive Øresund Bridge (perhaps familiar to viewers of The Bridge) to attend Copenhagen Comics, a biennial comic fest. Their website and programmes are, bizarrely when so much else is translated into English in the Nordic countries, only available in Danish. 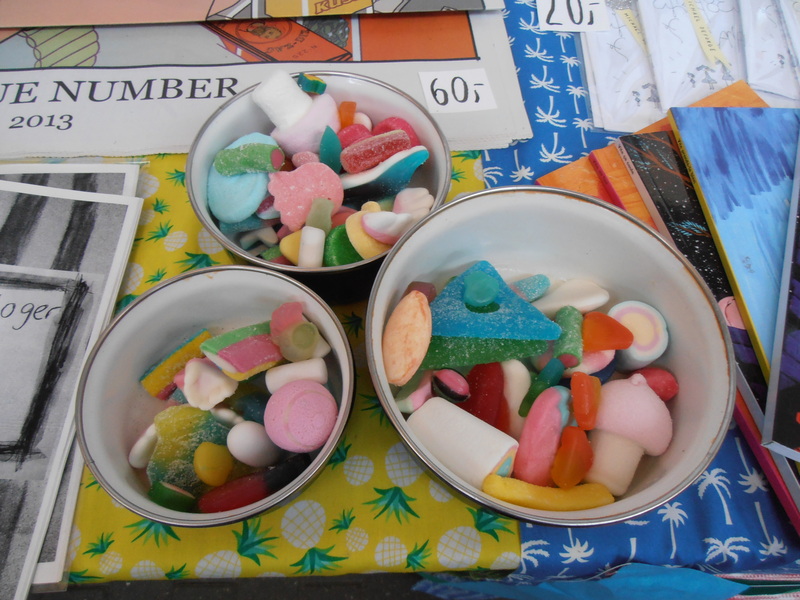 But hey, I speak Swedish, I’m a grown-up, I worked it out and found my way to Øksnehallen, the same location as Klimaforum in 2009, during the ill-fated COP 15, where I volunteered and felt like weeping a lot of the time, since it was clear that any ‘agreements’ being agreed would be toothless. 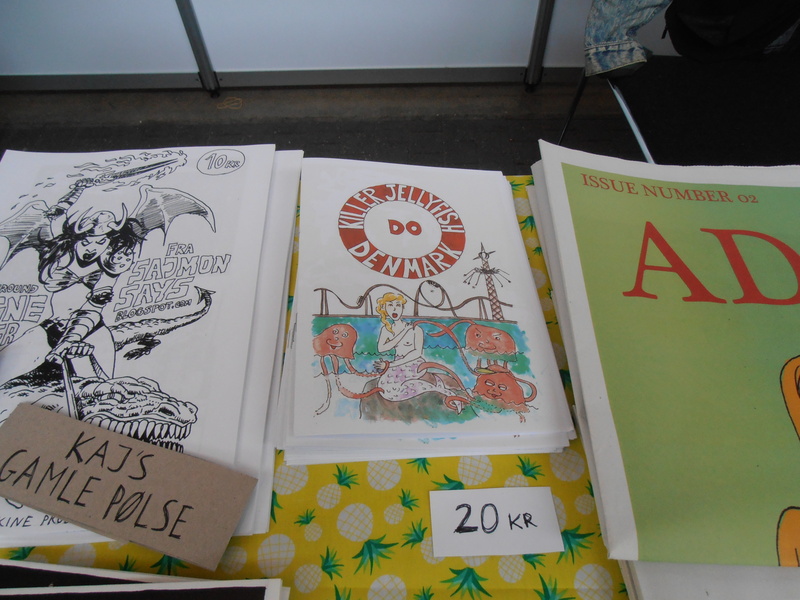 Hiring a table at Copenhagen Comics was ridiculously beyond my budget, but thanks to the general fabulousness of the women who organised Zine Fest with such aplomb last year in Copenhagen, I was able to sell Killer Jellyfish Do Denmark at the Zine Fest table. 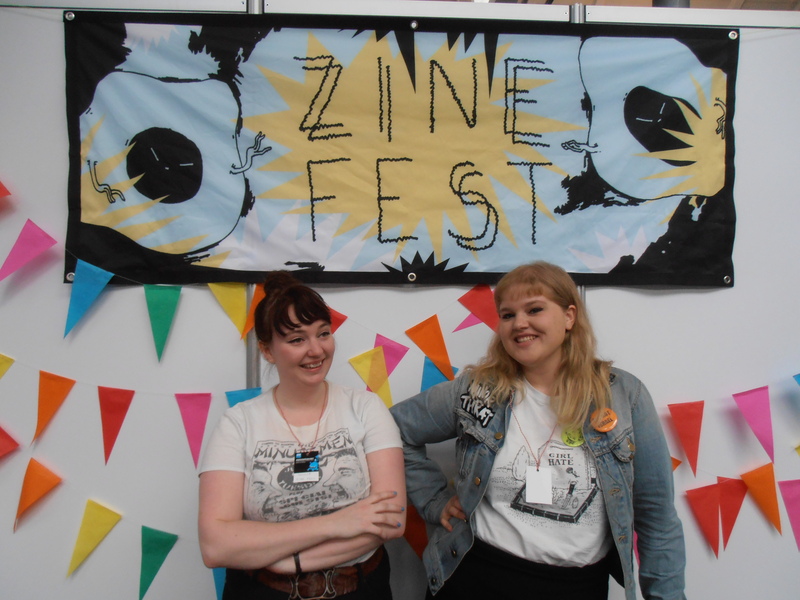 Many thanks to the Zine Fest team for their solidarity and keen negotiating skills! They also did a Child Catcher, enticing the young ‘uns with lots of sweeties. Though no children were captured or locked up in dungeons by the Zine Fest comic artists. None of the cosplay folks were dressed up as the Child Catcher. Francoise Mouly, co-founder, co-editor, and publisher of Raw, publisher of Toon Books, and art editor of The New Yorker was there. So was her husband Art Spiegelman, the world-famous author of Maus. He spoke about his long career and freedom of speech. Food for thought and inspiration from both of them. 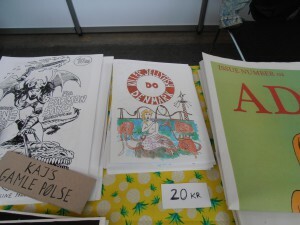 I was also impressed by the UK publishing outfit Nobrow. Nice books. Their love of illustration, respect for the reader (they have a fine children’s imprint Flying Eye Books) and a passion for the practicalities of printing books was a treat. It was great to see the connections between printing presses and printmaking and illustration and books and time and dedication presented in such an affable manner by Nobrow’s very sharp co-publisher Sam Arthur. At some point at any festival your feet start to hurt. It is too hot. You doubt anyone will ever read any comic you have ever drawn. You go home. You sleep. You get up again. You get back to the drawing board. I’ll let you know when the next comic is ready.